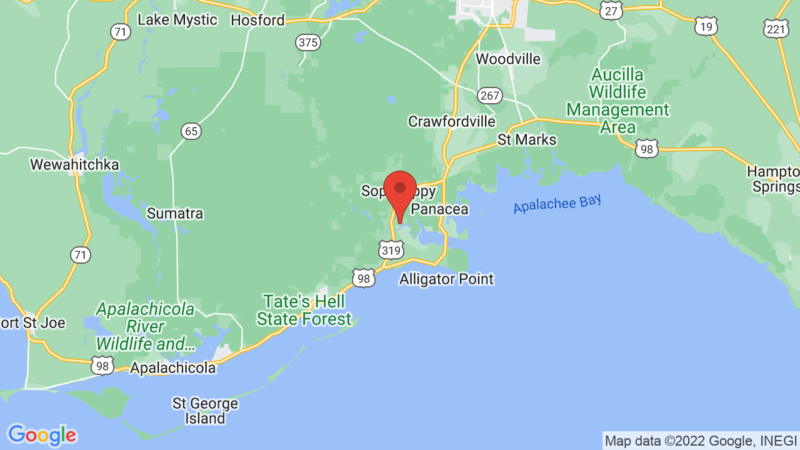 Ochlockonee River State Park Campground has 30 campsites (with water & electric hookups) nestled in the shady, wooded forest along the Ochlockonee River. The campground has drinking water, restrooms with flush toilets and hot showers, an RV dump station and campground host. Each campsite also has a table, fire ring and grate. Ochlockonee River State Park is a peaceful and quiet place, but there’s also plenty of outdoor recreation including boating, canoeing, kayaking, fishing, swimming, water sports, volleyball, picnicking and wildlife viewing.The animal life includes red-cockaded woodpeckers and trees such as pine flatwoods and oak thickets. The Park also has hiking and biking trails, a playground, volleyball courts, vending machines, group picnic areas and interpretive programs. You’ll find the swimming areas near where the Ochlockonee and Dead rivers intersect. There is a also boat ramp which provides easy access to the river. Both freshwater and saltwater fish inhabit the waters around the park, including largemouth bass, bream, catfish and speckled perch. Suwannee River State Park is another option. It is located about 110 miles to the east and also has 30 campsites. Visted Ochlockonee River State Park Campground lately? We'd love to hear about your adventure. Did you find us useful? Did we forget something? Anything our community should know before heading out to Ochlockonee River State Park?